Richard Matheson, author of many iconic works of sf and horror, died June 23 at age 87. His death came just three weeks after he announced his health was not good enough to permit him to attend the 2013 WFC where he is a GoH. RM: Pretty much the main character is always me. The man in I Am Legend is me. The man in The Shrinking Man, that’s me. Stir Of Echoes, that’s me. What Dreams May Come, me. He wrote 14 episodes of The Twilight Zone, including the classic “Nightmare at 20,000 Feet.” For Star Trek he wrote “The Enemy Within” where a transporter malfunction divides the Captain into Good Kirk and Evil Kirk. And he adapted his 1971 short story “Duel” into a TV movie for young director Steven Spielberg. 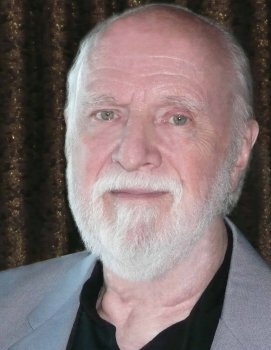 He won World Fantasy Awards for Richard Matheson: Collected Stories (1990) and his novel Bid Time Return (1976). Matheson received an Edgar Award from the Mystery Writers of America for his teleplay for The Night Stalker (1973). Matheson was the 1958 Worldcon guest of honor. He was inducted to the Science Fiction Hall of Fame in 2010, and was the recipient of World Fantasy Award, Bram Stoker Award, and International Horror Guild Award lifetime achievement honors, as well as being named a World Horror Grandmaster. He served in the infantry during World War II. In 1949 he earned a journalism degree from the University of Missouri. He moved to California in 1951 and married Ruth Ann Woodson the following year. They had four children. Update 06/24/2013: Corrected date of death per comment. This entry was posted in In Passing and tagged Richard Matheson by Mike Glyer. Bookmark the permalink. Does the writing credits of THE TWILIGHT ZONE episodes go to the first series, or both of them?